A stunning backyard transformed into a functional, family friendly outdoor living space. This backyard landscaping project features a unique blend of K2 Stone building materials. The home owner has incorporated Ocean Pearl stone exclusively throughout the backyard landscaping design. The dunk™ pool and spa has utilized natural stone pool coping with dimensional stone tile for the pool decking. 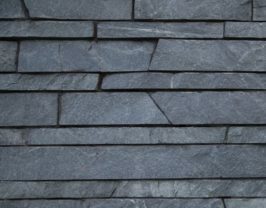 Each natural stone slate tile has a 12” width x 24” length x 1” thickness, which has been set into a bed of sand. The spa features Ocean Pearl pool coping with Pacific Ashlar stone veneer installed on the exterior walls. To finish the look the homeowner added Ocean Pearl Cut Wallstone as a retaining wall behind the spa as well as Ocean Pearl Patio Flagstone spaced periodically throughout the lawn. The home owner required a livable outdoor space that met the demands of their family’s active lifestyle. Additionally, they wanted a low maintenance yard so that they could focus on spending time with their family; rather than on yard work. The dunk™ pool and spa system was the home owners first choice, because it was quick and easy to install. To complete the look of the backyard, K2 Stone was used throughout because of it’s beauty, durability and the fact it requires virtually zero lifetime maintenance.